Presto might hate his muzzle, and he might look a little bit like the baby horse version of Hannibal Lector in it, but *knocking on every wood surface within reach* so far it’s working. He can’t wait to kick the crap out of all of us when he feels better. 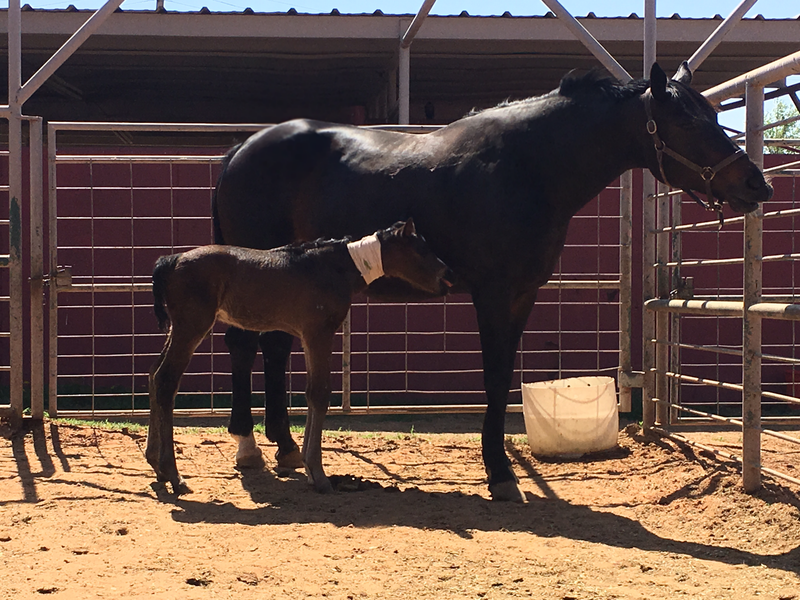 Yesterday morning they took the muzzle off briefly, and he readily went over and nursed (that is victory #1, because when he truly feels bad he has no interest in nursing). They watched him for a while to see if he would get colicky (pre-muzzle he would nurse and then within 15 or so minutes he’d be colicky) and he never did! So the plan is to slowly and steadily increase his nursing time to ease his intestines back into a normal routine. In the meantime Presto will still be getting his plasma and extra fluids to make sure he’s getting what his body needs. His electrolytes still kind of fluctuate a lot day by day or even hour by hour, so they’re constantly checking that and adjusting the content and quantity of his fluids as needed. A lot of you have asked how Sadie is handling all this, and the answer is: like Sadie does. She’s a beast but she’s very intelligent when it matters, and she’s been pretty great. Well… once they moved her to the outside pen, because she was SadieSmashing the stall inside (she legit left gouges in the metal from her teeth). But she allows the vets to do whatever they need to do with Presto, and she stands dutifully over him while he sleeps, which is a lot. She knows that something is up with him, because when he lays down for what she deems to be too long, she tries to get him up. I don’t think she quite understands why he doesn’t act like a “normal” baby (ie a terrorist in a tiny horse suit) but she’s pretty patient about it. We’re to the point where the updates from the vets are becoming less frequent, which… is generally a good thing. “No news is good news” and all that. Not that it lowers my anxiety level even a smidge, but it’s nice to know that he’s probably not in their top 3 most critical patients anymore. I’ll take that any day, even if it means less communication. I’m just really really (really really really) hoping the the positive trajectory continues and things get better for the little nugget from here. I love reading positive updates! Did they end up doing another ultrasound yesterday? I really don’t know. I’m guessing so? Trying not to bug his vets too much. I don’t blame you. Not texting every 10 minutes would be so hard for me. The poop is gonna be gross for a while, probably. Love his floppy ears and curled up legs in the first picture. Hoping he continues to get better. He is so lucky to have you. This feels really promising to read. My thoughts are with this little baby horse and I seriously hope he continues improving to become the little hooligan we all know and believe he can be! That first picture…is it my imagination or does he look slightly pissed off?? What a little fighter. Battling this for nearly a week now and still enough energy left to make sure everybody knows that THIS IS NOT OKAY. Go Presto!! I cannot even begin to imagine what he will be like “on the job” when he is grown up. He will be fierce. Also: loving the droopy donkey ears. I wanna smoosh his face!! So much baby anger. We will all pay once he feels better. Angry Presto! Keep fighting! I’m happy to reading what sounds like a sort of promising update. Yay! I’m glad to hear that so far it’s helping just as they hoped. He might not be happy about his mask but sounds like a good trajectory. Fingers crossed! So is there anything that could have prevented Presto from getting sick or is it just something that happens to some foals? Our vets think he was exposed while still in utero. You can’t really control every bacteria that a horse gets exposed to… you can help by having a clean area (his living area was thoroughly sprayed down with cleaner before the mare was ever brought into it, soooo) but sometimes they just get it despite doing everything right. All 3 vets just kind of shrugged their shoulders and said that the only reason he was even still alive was because of the extra diligence in this case. Neither of the other two foals got it. OMG…I just snort laughed when I read “terrorist in a tiny horse suit”. My coworkers probably think I am possessed! Thanks for the updates. Hannibresto is such a fighter! Still pulling for y’all! Wonderful news! Keep making leaps and bounds, Presto. We’re all rooting for you! YES. POSITIVE. Still sending all the vibes. Yay! Keep fighting Presto! Hopefully you’ll be a tiny terrorist in a horse suit again in no time. Come on tiny terrorist!! So glad to hear that he’s doing better!! Still sending those healing thoughts for his little tummy. This news makes me so happy! I’m still sending all the positive energy I have to Presto and you! That is good news to hear… still keeping all the crossables crossed. Yowza…. Time flies. Not sure how I could have miscounted quite that badly. Day 12 of being this sick and he still has energy to make his anger known. While it’s a blessing that Presto isn’t a tiny terrorist, this is not how it should be prevented! So great to see a more positive update! I hope this is the tail end of all the bad stuff and he’ll get to be a normal little terrorist baby from here on out.